58 • August 2018 • S I G N & D I G I T A L G R A P H I C S ARCHITECTURAL AND ENVIRONMENTAL P ost and panel systems are one of the oldest and simplest signs for exterior wayfinding and building identification, yet they have evolved over the years to look modern, while remaining economi- cally priced and easily customizable to fit the customer's needs. 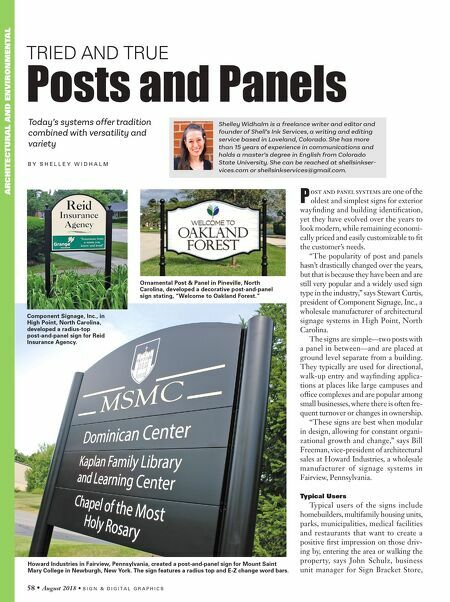 "The popularity of post and panels hasn't drastically changed over the years, but that is because they have been and are still very popular and a widely used sign type in the industry," says Stewart Curtis, president of Component Signage, Inc., a wholesale manufacturer of architectural signage systems in High Point, North Carolina. The signs are simple—two posts with a panel in between—and are placed at ground level separate from a building. They typically are used for directional, walk-up entry and wayfinding applica- tions at places like large campuses and office complexes and are popular among small businesses, where there is often fre- quent turnover or changes in ownership. "These signs are best when modular in design, allowing for constant organi- zational growth and change," says Bill Freeman, vice-president of architectural sales at Howard Industries, a wholesale manufacturer of signage systems in Fairview, Pennsylvania. Typical Users Typical users of the signs include homebuilders, multifamily housing units, parks, municipalities, medical facilities and restaurants that want to create a positive first impression on those driv- ing by, entering the area or walking the property, says John Schulz, business unit manager for Sign Bracket Store, TRIED AND TRUE Posts and Panels Today's systems offer tradition combined with versatility and variety B Y S H E L L E Y W I D H A L M Shelley Widhalm is a freelance writer and editor and founder of Shell's Ink Services, a writing and editing service based in Loveland, Colorado. She has more than 15 years of experience in communications and holds a master's degree in English from Colorado State University. She can be reached at shellsinkser- vices.com or shellsinkservices@gmail.com. Howard Industries in Fairview, Pennsylvania, created a post-and-panel sign for Mount Saint Mary College in Newburgh, New York. The sign features a radius top and E-Z change word bars. 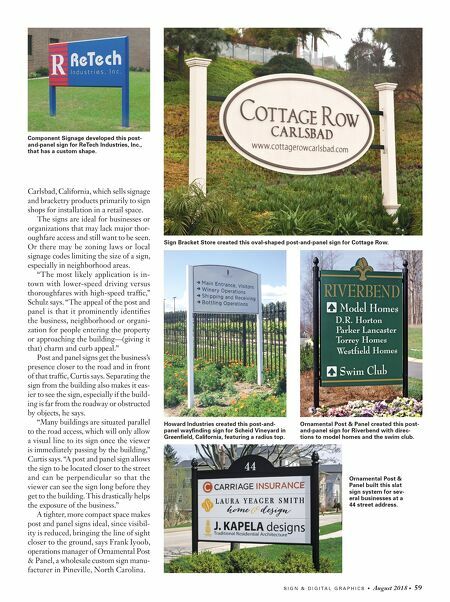 Component Signage, Inc., in High Point, North Carolina, developed a radius-top post-and-panel sign for Reid Insurance Agency. Ornamental Post & Panel in Pineville, North Carolina, developed a decorative post-and-panel sign stating, "Welcome to Oakland Forest."